Jacob Brumbaugh emigrated from Germany and first located near the Antietam in Maryland about the year 1780. He removed to Morrison’s Cove in 1788 and came to Woodcock Valley in 1794. On the 4th day of August 1800 he purchased from DavidMc Murtrie? a tract of land known as “Timothy Meadows,” on the south side of Warrior’s Ridge, containing two hundred and nineteen acres. 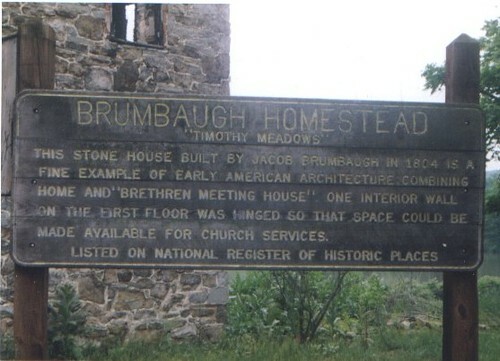 His grandson, Jacob Brumbaugh Sr., occupies the old homestead. Mr. Brumbaugh was twice married. He had fifteen children: nine sons and five daughters. David Brumbaugh Sr., who died at Marklesburg on November 19, 1880, was the youngest of his sons. Mrs. Susannah Markley, one of his daughters, removed with her husband many years ago to Ohio, where she died about a year ago. 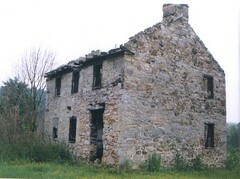 Location Marklesburg, Pennsylvania "Timothy Meadows" Stone house built by Jacob Brumbaugh in 1804. It was both a home and "Brethren Meeting House". Brumbaugh Homestead in Timothy Narrows, Penn Township, Huntingdon County, Pennsylvania. On a day of crisis in the Civil War, June 13, 1863, the people of Morrisons Cove suddenly found themselves in one of the front lines of defense for the cause of the Union. On that date, the vanguard of a force of 75,000 Confederate soldiers under General Robert E. Lee besieged the small force of General Robert H. Milroy at Winchester, Virginia, and prepared to advance into Maryland and Pennsylvania. The confederate soldiers and their leaders were inspired by the massive victory they had won at Chancellorsville, Virginia, and believed they were ready to invade the North, capture Philadelphia or New York, and dictate terms of peace. The Federal Army of the Potomac remained for a time at its camps in Virginia, the first concern of it leaders being the protection of the capital at Washington. For a time all of Southern Pennsylvania appeared open to the invaders. Governor Andrew Gregg Curtin, and his advisors at Harrisburg, faced with the problem of protecting the state from invasion, had to put together within a few days something which looked like an army. With the invaders threatening to come up the Cumberland Valley and perhaps advance their cavalry as far west as Beford County, state officials had a long line to protect. They had to defend the crossings of the Susquehanna River to prevent the raiders from entering the Lancaster and Philadelphia regions and from taking Harrisburg. Above all, they had to preserve the operations of the main line of the Pennsylvania Railroad, the rail shops at Altoona, and the furrnaces and forges of Morrisons Cove, then the center of the iron industry. And so on June 13 a telegram came from Governor Curtin to Samuel S. Blair and Attorney Robert A. McMurtarie at Hollidaysburg calling for emergency action. Those two men contacted Colonel Jacob C. Higgins of Duncansville, an army officer who was home on leave, and he agreed to take command of a force for the protection of this region. Colonel Higgins acted quickly. The call went out for armed and workers to build entrenchments. Overnight, the roads of the Cove were filled with marching columns. The plan of Colonel Higgins was to fortify the mountain gaps where a few determined men could hold off many. He selected the Loysburg, Snake Spring, Ravers Run and McKee gaps, and the high ground south of St. Clairsville on the main road from Bedford, for erections of barricades. The big question was whether there was enough time for the job, for the Confederates moved fast. General Milroy escaped with a remanant of his force, and some of his cavalry came out by way of Everett (Bloody Run) and then into the Cove where they found the forts under construction and manned by determined looking men with deer rifles. That turned Milroy's men around, and most of them stopped there and prepared to fight. The barricades in Loysburg Gap, built of log cribbing and rocks, were constructed under the direction of Major Alexander Bobb of Martinsburg. The trenches in Snake Spring Gap were dug by Hollidaysburg militia. These may be seen at the crest of the mountain, and are designated with an official state marker, placed June 29, 1963, 100 years after they were completed. The Confederate invasion with cavalry in front and flank swept norh through Chambersburg and Carlisle, and for a time Harrisburg was threatened. Confederate cavalry under General John D. Imboden on the left of the invaders reached McConnellsburg, and threatened Bedford and Mount Union, but the First New York Cavalry defeated a portion of Imboden's force at McConnellsburg, and by that time the gaps all were strongly held with expert riflemen. By June 29, General Lee at Chambersburg suddenly became aware that the Army of th Potomas was at Frederick, Maryland, and moving north to meet him. He then turned eastward and concentrated his army at Gettysburg where the two great hosts were locked in battle for three days, July 1, 2, 3. Lee's efforts to destroy the Federal Army failed and he had to retreat. General Imboden brought out the Confederate wagon train and sections of the gray artillery through Chambersburgh. A short distance south of there at Cearfoss Cross Roads, the First New York of Milroy's command struck the train at night, and brought to Mercersburg, 134 wagons, 645 prisoners and two pieces of artillery. With the passing of the emergency, the Minute Men of the Cove, who at one time under Colonel Higgins numbered close to 1,500 from Bedford, Blair, Somerset and Cambria counties, disappeared. They were never mustered into the Army, and so no record exists of their service except in a collection of papers of their commander and the remnants of the entrenchments they built. The service of the militia ws even ridiculed because they had to live off the country and they took food from the hen roosts of a number of local farmers. So the militia efforts was called "The Chicken Raid." It deserves a better title. They performed a brave and arduous task at a time of great confusion and fear. The official report of General Lee as to why he chose to retreat from Pennsylvania also speaks to the importance of the service by the Minute Men. On three separate occasions in the report, General Lee stated that his foraging parties could not gather horses and food bacause of the strong points held by the Federal Militia. The Minute Men of the Cove made a real contrinution to the victory at Gettysburg. Milton Burgess of Martinsburg, PA has condensed the story of this threatened invasion from his book, "Minute Men of Pennsylvania," included herewith for more details on the event, as "Minute Men of The Cove."